Up until now, there's never been a need to pay for the extra services or "skills" you can get for Amazon's Alexa voice assistant on Echo devices, but that's no longer the case. That's because Alexa now has a monetization model. It's a move that seems geared toward letting third-party skill developers get some cash back for their efforts and so possibly encourage other developers to start making skills for the platform. 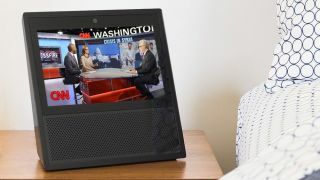 As Voicebot.ai discovered while using the Amazon Echo Show, the popular Jeopardy! skill is the first to enjoy the new monetization model. In exchange for $1.99 (about £1.50 / AU$2.60) per month, Echo users will get six extra questions (or "clues," in the game's parlance) per day while playing with Alexa. Amazon tells us the Jeopardy subscription model is US-only, for now. The payment model isn't as predatory as it possibly sounds. Most notably, you only have to pay for the extra questions if you're not an Amazon Prime member, and if you own any kind of Amazon Echo device, there's a good chance you're already a Prime member anyway. The new subscription also doesn't fundamentally change the way the skill works. Before, you only got access to six questions per day, but the "Double Jeopardy" subscription model brings that number up to 12. It's worth contemplating, though, how popular the developers will find the option when Amazon eventually rolls it out further, considering how common Amazon Prime subscriptions are. One possible answer is that Amazon may simply maintain its existing rewards program for Alexa skills, in which it simply flat-out pays developers for making "eligible skills that customers engage with most." The catch is that the system appears to be highly subjective, with the main criterion for qualification being described like so: "If your Alexa skill qualifies, you will receive an email from the Alexa team by the middle of the following month." Well, that's ... precise. In that context, knowing straight off that you're going to get $1.99 from each new customer who uses the skill seems like a far more appealing bet. But will Alexa lose some of her appeal in the process?